Nearly 24% of Australian suppliers surveyed consider maintaining adequate cash flow levels to be the greatest challenge to business profitability in 2016. Commodity-rich countries like Australia will face headwinds in 2016 and 2017 following the decline in commodity prices. While Australia is making an effort to diversify its economy, aided by its depreciating currency and the loosening monetary policy, bankruptcies for 2016 are forecast to increase by 8%. Due to the vulnerability of its economy to low commodity prices, many Australian businesses have a strong focus on trade receivables management, and protect their cash flow and profitability against the risk of payment default arising from B2B trade on credit. Suppliers surveyed in Australia seem to be almost equally inclined to sell on a cash basis or to offer credit terms to their B2B customers. On average, 49% of the total value of Australian suppliers’ B2B sales were made on credit (no change from last year). This percentage, which is slightly above the 46% average for Asia Pacific, places Australia in the cluster of countries surveyed in the region (along with Hong Kong, Japan and Singapore) which appear to make extensive use of trade credit in B2B transactions, both in their home markets and abroad. Compared to last year, the proportion of B2B sales transacted on credit by Australian suppliers increased, on average, by 3%. 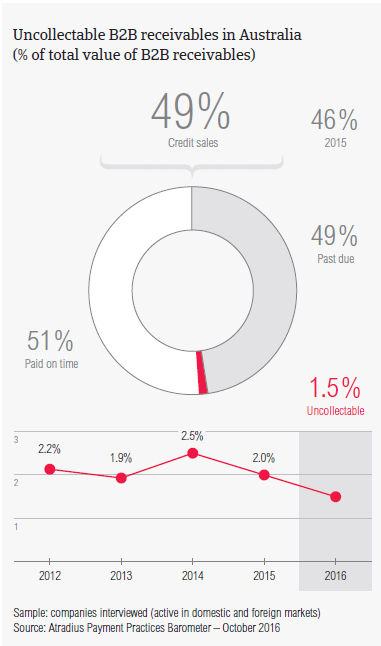 Credit-based sales increased almost equally on both domestic and foreign markets. Along with a great openness to granting trade credit to B2B customers, Australian suppliers show no preference for selling on credit to either domestic or overseas customers. 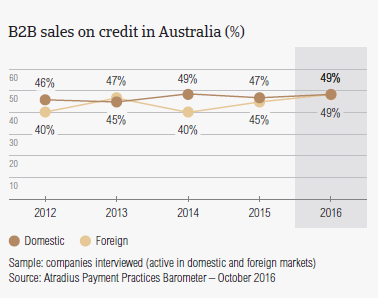 On average, half of the total value of Australian suppliers’ B2B sales to either domestic or foreign customers was made on credit. This behaviour, which shows suppliers’ uniform perception of payment risk arising from either domestic or foreign B2B trade, differs from the regional pattern. This latter points to a clear-cut preference of suppliers surveyed in Asia Pacific for granting credit terms domestically (50.3% of the total value of domestic sales was on credit) than abroad (42%), which is likely to reflect a widespread perception that trading on credit with export markets implies more challenges than doing the same on the more familiar home territory. 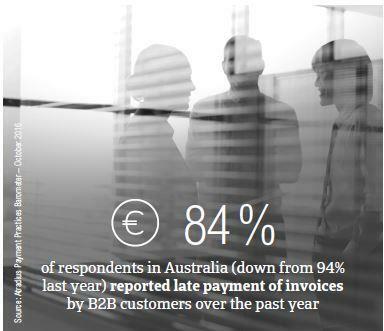 84% of respondents in Australia (down from 94% last year, and compared to 88% at regional level) reported late payment of invoices by domestic and foreign B2B customers over the past year. As a result, On average, half of the total value of B2B receivables, remained unpaid after the due date; mostly arising from foreign trade. This percentage, which decreased by nearly 6% compared to one year ago, is above the 44% average for Asia Pacific. 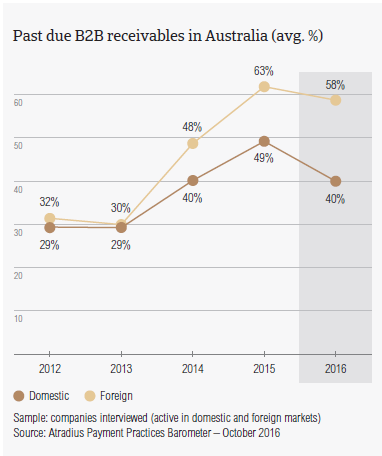 Based on responses given by Australian suppliers, a significantly larger proportion of the total value of B2B receivables arising from foreign (57.6%) than from domestic B2B trade (40.3%) remained unpaid after the due date. In particular, the foreign default rate recorded in Australia is the highest of all the countries surveyed in Asia Pacific. Besides highlighting that Australian suppliers are the most impacted by foreign late payment among the Asia Pacific countries surveyed, this finding suggests they manage domestic trade receivables better than foreign ones. This assumption appears to be confirmed by the year-on-year comparison between the trends of domestic and foreign payment default rates in the country. Over the past year, foreign default rates increased, on average, by nearly 9%, compared to an average 5% increase in the domestic payment default rate. Late payment of (domestic and foreign) B2B invoices in Australia is reflected in the average Days Sales Outstanding (DSO) figure of the survey respondents. This averages 25 days (well below the 41 days regional average). Although a week longer than one year ago, it remains the lowest in the Asia Pacific region. This increase may indicate that Australian suppliers are now less effective in collecting long outstanding invoices of high value than one year ago. This may be the reason why more suppliers in Australia (nearly 24%) than in Asia Pacific (nearly 20%) consider maintaining adequate cash flow to be the biggest challenge to profitability this year. Consistent with the earlier mentioned upswing of DSO over the past year, the percentage of Australian suppliers expecting a further increase over the next 12 months (23%) is notably higher than that anticipating a decrease (8%). This is likely to reflect Australian businesses’ concern about the potential impact of slower economic growth, which is mainly due to the impact of the slowdown in China (the biggest destination for Australian exports) on the local insolvency environment. Seven in ten Australian suppliers, however, do not anticipate changes in DSO over the same time frame. 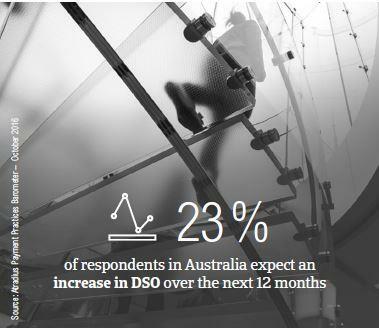 In line with expectations of a further DSO increase over the next 12 months, most of the suppliers surveyed in Australia (nearly 24%) consider maintaining adequate cash flow levels to be the greatest challenge to business profitability this year (respondents in the region: 19.6%). This reflects Australian suppliers’ concerns about a potential worsening of their liquidity position, as well as about an increase in the financial and administrative costs of carrying long outstanding trade receivables. It is worth noting that more suppliers in Australia (19%) than in Asia Pacific (11%) consider a likely fall in demand of their products and services as the greatest challenge to profitability this year. Again, this is likely to chiefly reflect Australian suppliers’ concerns about the impact that lower demand from China could have on their businesses. Australian suppliers request both domestic and foreign B2B customers to pay invoices, on average, within three weeks of the invoice date. This is well below the 32 days average for Asia Pacific and the shortest observed for the countries surveyed in the region. This may reflect an attempt of Australian businesses to counter a potential worsening of their liquidity position (due to an expected upswing in DSO) with short terms for payment of invoices. This latter, however, has remained stable over the past year, pointing to a payment culture which places a strong emphasis on swift payment. 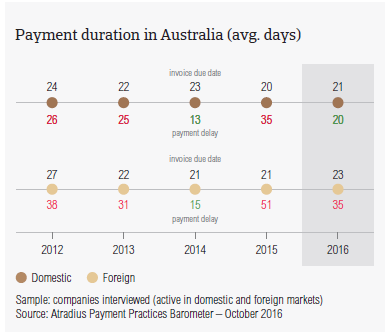 Despite no change in the short payment terms granted by Australian suppliers to both their domestic and foreign B2B customers, domestic customers settled past due payments around two weeks earlier than last year (on average 20 days). Foreign B2B customers, however, settled past due bills significantly later, on average, around 35 days after the due date. Besides reflecting foreign customers’ inability or unwillingness to pay, (the underlying reasons will be discussed later) these notably longer foreign payment delays may explain why most of the suppliers surveyed in Australia (31%, compared to 45% in Asia Pacific) plan on checking their buyers’ creditworthiness more often over the next 12 months. Almost as many suppliers in Australia (nearly 45%) as in Asia Pacific (46%) are of the opinion that their domestic B2B customers pay invoices late due to liquidity issues. The Australian response rate for this reason is almost the same as that recorded one year ago. In contrast, notably more suppliers in the country (36%, compared to 32% last year) than in Asia Pacific (27%) expressed the opinion that domestic B2B customers delay payment of invoices intentionally, as they use outstanding debts to finance their businesses. Although most of the suppliers surveyed in Australia (nearly 30%, below the 34% regional average) reported that foreign B2B customers pay invoices late due to liquidity issues, foreign late payment appears to be most often attributable to reasons that are unrelated to the liquidity position of the customers. These are the complexity of the payment procedure, inefficiencies of the banking system and intentional slow payment as a form of business financing (each reason cited by 25% of Australian suppliers). Only the response rate for this latter reason is higher than that recorded at regional level (22%), suggesting that this opinion, expressed also in respect to domestic late payment, is notably stronger among Australian suppliers than suppliers in Asia Pacific overall. 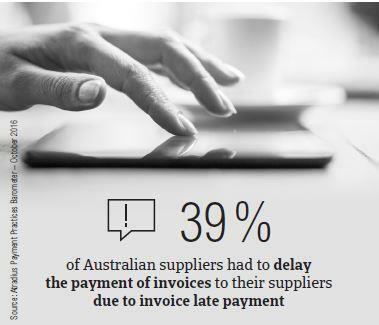 Regardless of the reasons why customers pay invoices late, late payment by customers of respondents caused more suppliers in Australia (39%) than in Asia Pacific overall (33%) to delay payment to their suppliers, causing a ripple effect throughout the whole supply chain. 31% reported they had to take specific measures to correct cash flow (regional response rate: 34%). To protect their businesses against the risk of payment default from B2B customers, 31% of Australian suppliers (45% in Asia Pacific) said they will increase creditworthiness checks of their customers over the next 12 months. 29% will monitor the credit risk associated with their buyers more often over the same time frame (regional response rate: 41%). The proportion of B2B receivables reported by Australian suppliers as being written off as uncollectable (1.5% of the total value of B2B receivables) is below the average for Asia Pacific (2.1%). Domestic uncollectable receivables were written off as often as foreign ones. Compared to last year, the percentage of write-offs in Australia decreased slightly. Uncollectable domestic B2B receivables originated most often from the construction, electronics and business services industries. In line with the regional response rate, 64% of the suppliers surveyed in Australia (compared to 51% in Asia Pacific) wrote off receivables as uncollectable most often because the customer went bankrupt or out of business. This tallies with the still difficult insolvency environment in which Australian businesses currently operate (bankruptcies for 2016 are forecast to increase by 8% in the country). Around 40% of Australian suppliers (35% in Asia Pacific) wrote off receivables as uncollectable because the debt was too old to be collected. This is consistent with the above mentioned findings related to the DSO trend in Australia. Suppliers surveyed in Australia reported trading on credit terms mainly with B2B customers in the consumer durables, construction, metals and mining, energy and business services industries. Invoice payment terms extended to B2B customers in the metals industry appear to be slightly above the country average (averaging nearly 30 days from the invoice date). B2B customers in the ICT industry take the longest to pay overdue receivables (on average, within 30 days after the invoice due date). This is also the industry which generated the largest proportion of past due B2B invoices. Around 55% of the total value of B2B invoices issued by suppliers in Australia to B2B customers in this industry were paid late. Based on survey responses, late payment of invoices due to liquidity constraints from customers occurred most often in the construction industry (53% of suppliers surveyed in Australia mentioned this). However, around 45% of the suppliers in all the other industries surveyed expressed the opinion that B2B customers delay payment of invoices intentionally as a form of business financing. Half of the Australian suppliers trading on credit with B2B customers in the chemicals and the construction industries do not anticipate any change in the payment behaviour of their B2B customers over the next 12 months. This is the case for 67% of suppliers in the metals sector and for around 40% of suppliers in the ICT industry, where more suppliers (58%) expect an improvement than a worsening (10%). The transport industry is the only industry where more Australian suppliers expect a worsening in B2B customers’ payment practices (30% of suppliers) than an improvement (6%). The Australian government is driving growth in the IT market through its purchase programme and various initiatives, such as a Cyber Security Strategy.